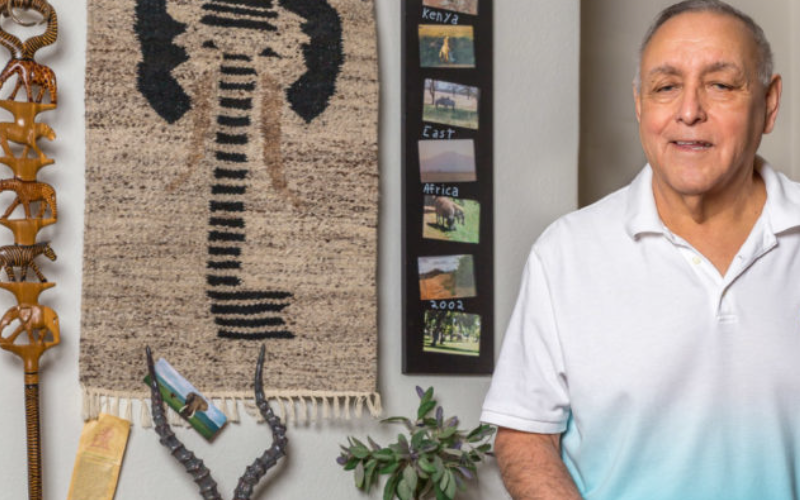 Sun City West resident Gil Vasquez has lived an active and full life, serving his country, traveling the world and thriving in a longtime career. In retirement, he started thinking about how he could give back and support a worthy charity. At first, Gil considered an out-of-state charitable organization. But when Gil was hospitalized at Banner Boswell Medical Center in Sun City, he changed course and put his thoughts into action. Gil wanted his giving to “stay local.” For him, Sun Health Foundation offered the ideal way to do that. The Foundation is the exclusive fundraising partner for both Banner Boswell and Banner Del E. Webb medical centers, a wide range of community wellness programs and vital medical research. It’s no surprise that Gil ultimately decided to support his community. An Arizona native, he was born and raised in Glendale. He enlisted in the Navy in the 1960s, just before the Vietnam War, and dove into radio school. Gil ultimately served three tours, traveling to many different ports. Life after the service included marriage, raising two children, work in the aerospace industry and a move back to Arizona, where Gil landed a job with Salt River Project. He stayed with SRP for 32 years, retiring as a lead relay technician. Gil also spent many of those years traveling widely, enjoying everything from the pristine beauty of Antarctica to the wild animals of Africa to the beautiful museums of Russia. Once he settled into retirement, Gil volunteered at Banner Del E. Webb Medical Center, helping ferry patients and visitors around the hospital campus. He also became interested in the work of the Banner Sun Health Research Institute, which seeks to unravel the mysteries of Alzheimer’s and Parkinson’s diseases. When Gil needed surgery and required a five-day stay at Banner Boswell — the first time he had ever been a patient in a hospital — he was grateful for the caring staff and expert care. Gil later attended an open house at Banner Del E. Webb and learned about the innovative Progressive Care Unit. The unit, supported by Sun Health Foundation, is designed to provide faster healing time for patients, adequate space for family members to take part in the healing process of their loved ones, and an overall improvement in patient care. Beyond the Progressive Care Unit, Gil discovered that the Foundation serves the Sun Cities community in myriad ways through its programs and services. He decided to support the foundation using a donor-advised fund. The philanthropic vehicle allows donors to make charitable contributions and receive an immediate tax benefit. “It’s a very convenient way to support the organizations that are meaningful to you,” says Wendy Nelson, a fund development program director with Sun Health Foundation. Gil appreciates both the convenience — he can handle his giving online through his mutual fund — and the ability to decrease his tax liability.